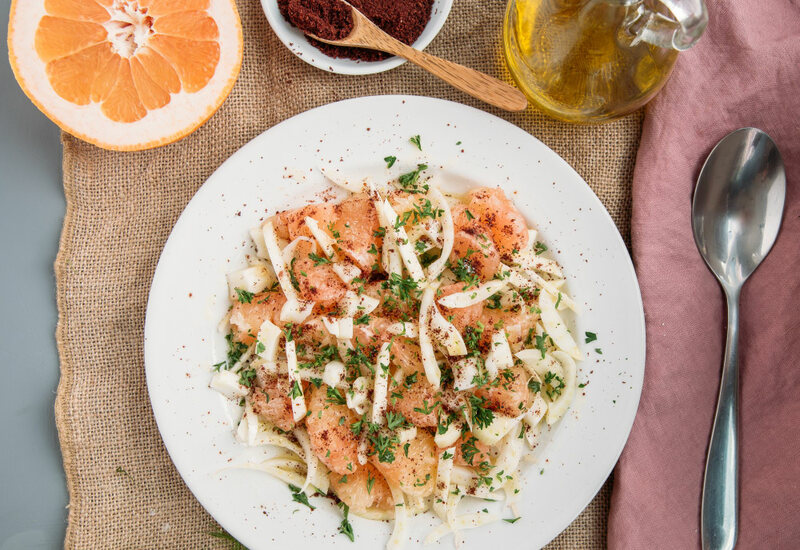 Make this fennel and grapefruit salad part of your fall menu. The key to this dish is using sumac - a sophisticated spice you should certainly add to your pantry. Sumac has a subtle lemon flavor that’s not overpowering. (Try it in your favorite salads, lemon chicken recipes or in hummus!) Here the sumac is used to bring out the earthy flavors of the dish while brightening up the dish along with fresh lemon. The result is a colorful salad that is also light and refreshing. To prepare the grapefruit for this salad, Start by trimming the top and bottom of the fruit. Then slice lengthwise between flesh and peel, following fruit's contour to remove both the peel and pith. Next, slice lengthwise between one segment and the membrane until you reach the center of the fruit. Make another slice on the other side of the segment. Gently use the knife blade to remove segment. Repeat until all the segments are removed. Per Serving: 195 calories; 18g fat; 9.4g carbohydrates; 1g protein; 0mg cholesterol; 162mg sodium. This is one of my favorite summer salads. The sumac lemon dressing is also one of my favorites. I put it on everything! If you like grapefruit, you will love this light salad! I was able to snag some sumac from a specialty store just so I could make this delicious lemon dressing. It's so delicious! I love grapefruit, and it's season right now, so they're extra fresh. Perfect for dinner parties!